I made both cards quickly and easily using the Sale-A-Bration stamp set Patterned Occasions, and designer paper called Sycamore Street. The button on the anniversary cards and the ribbon on the birthday card are from the ribbon and button pack (another Sale-a-Bration item!) 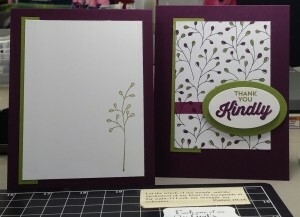 I used the Decorative Label punch on both and added a little Dazzling Details at the end for an extra something special! It took me about 10 minutes to make both cards, including figuring out the layout, colors and papers to use! I used my two favorite papers from the Sale-A-Bration Sycamore Street designer paper! There’s still time to get the Sale-A-Bration 2013 exclusive items. Visit my info page for details, or contact me with questions. Sale-A-Bration ends on March 22nd – so don’t miss it! Make your own really cute mini box without a Big Shot or loads of measuring. 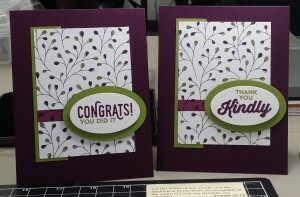 Simply print an MDS2 template onto card stock, cut/score, and decorate; with free Sale-A-Bration goodies! Don’t have MDS2? Try it out for FREE for 30 days. I think you’ll love it! 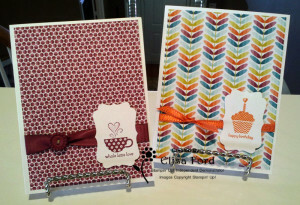 Open the stamp brush set for Mini Project Boxes and drag over the first one, the square box. With page-bleed ON, make the box template as big as you want, without going over the margins. You can also leave the box exactly as it comes over, without any adjustments in size. 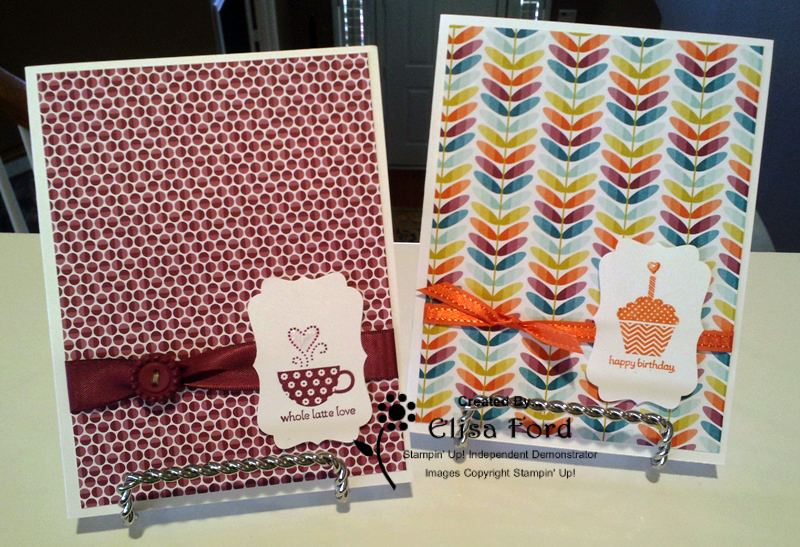 Using your printer and Pool Party card stock, print this page. 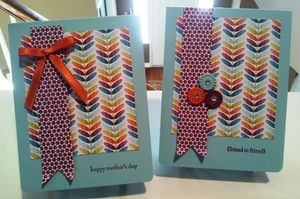 Cut along the solid lines on your box template with Paper Snips and then score your dashed lines. Then reinforce your scored lines with your bone folder. 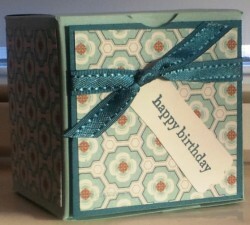 Fold the box so that the lines printed on the card stock end up on the inside of the box. Adhere your designer series paper onto your side and back box panels with SNAIL Adhesive. Layer a square of DSP onto a slightly larger square of Island Indigo card stock and adhere to the front panel of your box using dimensionals. Slide the Island Indigo ribbon under the raised front panel of the box, tying into a knot. Stamp the “happy birthday” sentiment and punch it out with the Modern Label punch. Adhere to the front of your box using SNAIL Adhesive. Construct your box using Sticky Strip. Fill the adorable mini box with candy, jewelry, or other small gifts and give it to your loved one!